Greg Tacker, a 1982 member of the Memphis Blues drum line, sent this picture. My son Colin and I seem to have started somewhat of a tradition of sending in a photo from one of our drum corps trips every year. 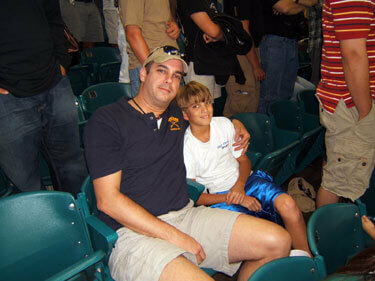 This photo is of the two of us while we were at the DCI Atlanta Southeastern Championship last summer. We are fired up and very excited about the upcoming season. We can't wait to see more Memphis Blues Brass Band alumni this year!